Horyuji is located in the Land of Ikaruga, belonging of Prince Shotoku , sometimes called Prince of Umayado who is the main politician in Asuka era, and attributed with having introduced Buddhism to Japan. Horyuji is one of Japan's oldest temples. 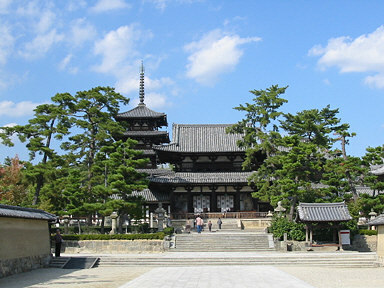 Its main hall, five storied pagoda and central gate, all located in the temple's Saiin Garan (Western Precinct) and dating from the 7th century, are the world's oldest surviving wooden structures. In 1993, Horyuji was designated a UNESCO world heritage site. Gojuno-to (five-storied pagoda) of Horyuji seems feminine compared to manly towers of Kofukuji or Toji. Chumon (middle gate) is one of the buildings which show characteristics of Asuka's architecture and serves for an entrance to the west monastery. The columns which swell out at its center are called "entasis" and originate from an influence of the ancient Greco-Roman architecture. The oldest statues of Kongo-rikishi (guardians of Buddhism) in Japan are installed at the both sides.